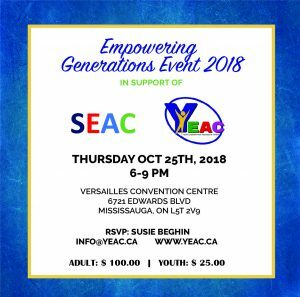 Join us on Oct 25th from 6-9 pm for a fundraising dinner to support programs for at-risk youth and seniors in Brampton/Mississauga. The event includes a full dinner, entertainment, business and community networking and a vendor marketplace. Our goal is to raise $100,000 during the event. We expect attendees and guest speakers from all levels of government in Peel in addition to business and community leaders. Copyright © 2019 YEAC. Powered by WordPress. Theme: Spacious by ThemeGrill.